At Mills Industries, our vision is to provide products that help achieve sustainability objective that "meets the needs of the present without compromising the ability of future generations to meet their own needs"1. Mills also endeavors to be socially responsible company to our employees and to the community. To see our Environmental Policy Statement please click here. Purchasing 100% non-carbon-based renewable energy for its manufacturing and office facility. Choosing an extrusion supplier that uses 100% hydro power. Mills has also instituted an environmental management system (EMS) to help us reduce our impacts. To track the environmental impacts of our products, a Life Cycle Assessment was conducted on the shop to provide a view into the environmental impact of polypropylene packages versus a corrugated paper box and a molded plastic box. A product Life Cycle Assessment (LCA) is a systematic, data-based method for assessing the full environmental impact of a product across its life, including the extraction or acquisition of raw materials, production of interim product components, final product manufacturing, distribution and transportation across all steps in the life cycle, product usage and product end-of-life disposition. Acidification Potential (AP) - Contribution to increasing acidity of land or aquatic environments. Eutrophication (EP) - Contribution to over-deposit of nitrates/phosphates in land or water environments. Terrestrial Ecotoxicity Potential (TETP) - Contribution to accumulation of toxins in land ecosystems. Photochemical Ozone Creation Potential (POCP) - Contribution to summer smog formation. Mills' PP carton manufacturing process represents a very small percentage of the overall life cycle impact for all impact categories, at less that 1% of the overall impact for all six impact categories. Choosing an extruder that uses hydro-power has reduced the overall life cycle GWP impact of the PP carton by 22% from what it would have been using the standard U.S. power grid mix, and by 10% from what it would have been using the standard Canadian power grid mix. Several decisions and actions by Mills regarding its manufacturing process have significantly reduced the impact of those specific sub-processes over standard alternatives. The key driver of the PP carton's reduced impact compared to the HDPE tote is the significantly lower amount of plastic material required to produce the PP carton. Along with the reduction of pollution, our products excel in many other fields of sustainability. The durability of a Mills container ensures the user a prolonged span of re-usability, unlike corrugated paper boxes, which often tear and are easily damaged by water and susceptible to molding. 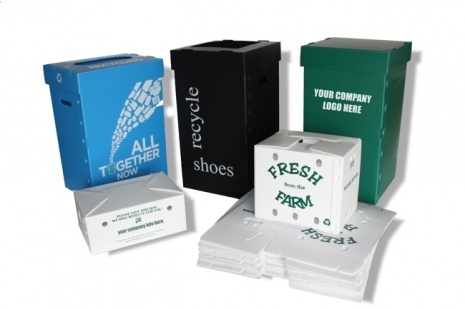 A reusable corrugated plastic box can do a lot from an environmental perspective; it saves a plethora of raw materials in comparison to corrugated paper, as it can rarely be used more than a handful of times, which requires the cultivation of raw materials, transportation to factories, manufacturing, transportation to customer and disposal. In comparison to molded plastic containers, the advantages of our boxes are abundant. Our containers can be 50% lighter than molded plastic, which offers more flexibility, and versatility, yet does not compromise strength with our structurally-sound fluted design. The flexibility of our product helps us reach a lean manufacturing initiative. A green benefit to offering a lighter box, the materials and production leave a significantly softer impact on the environmental. We offer a vast amount of customizable options, to perfectly fit the item(s) our customers are trying to package, in contrast, a molded plastic box due to its inflexibility, and heavier weight, causes this style of box to fall into relative uniformity. the mid-ninties, which shows our long term dedication. We are currently in the process of establishing an Environmental Management System, which will help us gain a better perspective, and further decrease our impact on our planet. All production scrap generated by our facility is recycled, as well as all other recyclable waste, and we have switched from solvent cleaners to green alternatives. Our wind-powered facility reduces our Global Warming Potential by 22% compared to the standard United States power grid. We also firmly believe in a fair and safe working environment for our employees to prosper in , as all workers at Mills Industries are offered healthcare coverage. We believe we are helping to shape a better tomorrow. Here at Mills Industries, we're always looking to innovate, whether it be in the field of packaging, or sustainable manufacturing, we stride to be on the cutting edge of new ideas. Through eco friendly initiatives we are investing in our planet, as well as the next generation. Though we may just be a humble family-run packaging company, we feel as if we have a small hand in creating a brighter future.